Please be advised that RENDEZVOUS! has moved to the third Monday of the month. Our next session is November 16th! Meet Wiseacre at the RENDEZVOUS! My man rocked the decks at the infamous Do-Over party on the 13th, and is gearing up for DEEP on October 3rd, and NYC's Turntables on the Hudson on October 24. 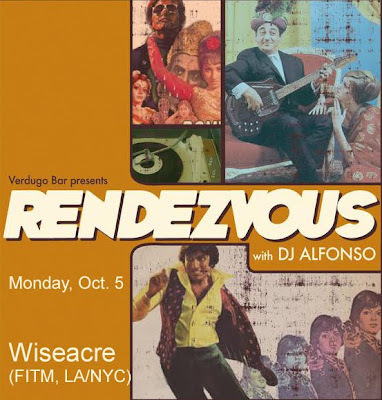 This Monday, October 5th, WISEACRE returns to RENDEZVOUS! He'll no doubt bring his crate of downbeat soul-funk-disco-afro-latin goodness (all vinyl, of course). Cult, B-movies featuring Msr. Gainsbourg & the lovely Soledad Miranda will be screened for your viewing pleasure. Also, yours truly returns to the tables after taking some paternity time off! I will be spinning all your favorite Turkish fuzz, psych-funk, Latin, French & Italian soundtracks, Brasilian goodies, and some new re-edits. DJ Jimmy opens up the night with some classic hip-hop and downtempo. 10PM & always FREE!